For many, James Baldwin is associated with novels, fiction. But my greatest affinity for Baldwin lies with his nonfiction and his role as a public intellectual. In the volume I co-edited, James Baldwin: Challenging Authors, chapter authors examine Baldwin as a powerful voice across genre and form. Concurrent with that volume is the publication of Jimmy’s Blues and Other Poems. 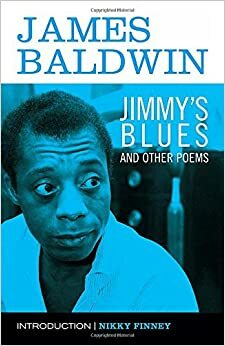 Baldwin is rarely examined as a poet so this collection is significant for those new to Baldwin as well as those who have studied and treasure his complete canon. “Playing by Ear, Praying for Rain: The Poetry of James Baldwin,” the introduction by Nikky Finney, opens the collection passionately and parallels Baldwin’s own challenging persona: “Baldwin was dangerous to everybody who had anything to hide,” Finney warns (p. ix). In his work he remained devoted to exposing more and more the ravages of poverty and invisibility on black and poor people…. For me, as someone drawn to Baldwin’s nonfiction and videos of his speaking, these poems fits into those contexts in ways that give his poetry a vibrancy beyond the grave. Baldwin’s poetry is Baldwin’s voice. Simultaneously, “Staggerlee wonders” is deeply steeped in the U.S. of Baldwin’s lifetime and disturbingly relevant to 2014. The speaker mentions Russia, China, the Panama Canal, and Vietnam along with “Mad Charlie,” Patty Hearst, John Wayne, Ronald Reagan, and Mohammad Ali. But the historical, political, and pop culture references do not date the poem since Baldwin uses them as vehicles for his truth-telling. This poem reveals Baldwin’s craft, his ability to be deeply personal and bound by his moments of history while speaking against and to the great questions of being human when humans fail their humanity. As National Poetry Month 2014 comes to a close and as we move toward Baldwin’s 90th birthday in August, now appears to be right for exploring Baldwin the poet.